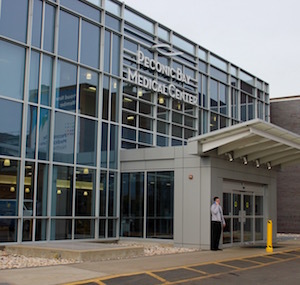 Peconic Bay Medical Center in Riverhead will begin operating as a Level III Trauma Center on March 1, after earning provisional status from the New York State Department of Health. To receive a designation as a Level III Trauma Center, a facility must demonstrate the ability to provide prompt assessment, resuscitation, surgery, intensive care and stabilization of injured patients and emergency operations. Southampton Hospital became a Level III trauma center last year, but Eastern Long Island Hospital in Greenport is not yet a trauma center, though both ELIH and Southampton Hospital have merged with Stony Brook University Hospital, the only Level I Trauma Center in Suffolk County. Capabilities of a Level III Trauma Center, according to the American Trauma Society, include emergency medicine physicians who provide immediate coverage 24 hours a day, the prompt availability of general surgeons and anesthesiologists, transfer protocols for patients requiring more comprehensive care at a Level I or Level II Trauma Center, providing back-up care for rural and community hospitals, continued education of the nursing and allied health personnel or the trauma team, active prevention and outreach programs for its referring communities and a comprehensive quality assessment program. PBMC is scheduled to break ground this summer on a new, $60 million Critical Care Tower expansion that will include a heart care center, two cardiac cath labs, an electrophysiology lab and an expanded emergency department. SkyHealth Helicopter Emergency Medical Service will also provide patients with access to faster transport options when medical needs arise. SkyHealth is a medical helicopter that part of the Northwell Health hospital network, which PBMC joined last year. It is stationed at Islip MacArthur Airport, and is used to transport trauma victims from one hospital to another.